1. USE ALONG WITH MILK TO CREATE A FAKE CAPPUCCINO. 3. INSTANT METHANE REMOVAL FROM OFFICE OR CUBICLE. 4. CAN BE USED TO RE-CREATE THAT “GREAT NORTHEASTERN WIND A BLOWIN” WHEN CALLING CLIENTS. 5. A QUICK AND SOMETIMES EFFICIENT WAY TO GIVE YOURSELF THAT “HARRIED” LOOK AT THE OFFICE – TO BE AVOIDED BY TOUPEE WEARERS. 6. HAVING A BAD HAIR DAY? THEN SLAP SOME WATER ON YOUR HEAD, SMOOTH YOUR HAIR AND DRY IT WITHOUT HAVING TO BEND OVER TO GET TO THE HAND DRYER. 7. QUICK BURN RELIEF: USE SPARINGLY, OR YOU’LL END UP WITH FREEZER BURN, TOO. 8. DOG TRAINING – IT’S BETTER THAN WHISTLING. 9. CAT REMOVAL – A QUICK PSSSSSSSSSSSST IS GUARANTEED TO SCARE EVEN THE TOUGHEST ALLEY CAT. 10. CLEANING THE LINT BUILDUP OUT OF YOUR NAVEL ON REALLY SLOW DAYS. AND WHY IS THE LINT ALWAYS BLUE? 11. AIM AT THE TOP OF THE CUBICLE CABINET TOWARD THE PERSON ON THE OTHER SIDE TO MOVE DUST AND OTHER MISCELLANEOUS DEBRIS TO WHERE IT RIGHTLY BELONGS. 12. USE THE COOLING NATURE OF CANNED AIR TO HEAT UP YOUR OFFICE IN THE COLD WINTER MONTHS. JUST SPRAY THE THERMOSTAT WITH A HEALTHY SHOT OF CANNED AIR, AND WAIT FOR THE HEAT TO KICK IN! 13. WHILE CAN IS BEHIND YOUR BACK, FOLLOW SOMEONE INTO THE ELEVATOR AND A GOOD, LONG BLAST, THEN LOOK AROUND EXCITEDLY EXCLAIMING THAT YOU’RE TOO YOUNG TO DIE THIS WAY. 14. GIVE A WHISTLE THE ENERGY IT NEEDS TO CONVINCE YOUR BOSS THE EVACUATION ALARM SOUNDED. 15. CONSERVE TREES BY BLOWING THE SEEDS AND EXCREMENT FROM THE BOTTOM OF BIRD CAGES, THUS SAVING THE PAPER FOR FURTHER USAGE. 16. CLEAN THE CRUMBS FROM A BUCKET SEAT. 17. DON’T HANDLE THEM DIRECTLY – BLOW THE DUST OFF THOSE MOUSE BALLS! 18. EAR WAX REMOVAL. PLACE THREE DROPS OF WARM SALT WATER IN THE EAR CANAL. ALLOW TO SET FOR ONE MINUTE. HOLD AIR-STRAW TWO INCHES FROM EAR CANAL, BLOW… SEE IF YOU CAN HIT SOMEONE WITH THE FLYING WAX. 19. BLOWING LIQUID THROUGH A STRAW. WITH THE USE OF COMPRESSED AIR, THE LIQUID CAN BE BLOWN FURTHER. WITH THE USE OF 1/2″ DIAMETER PLASTIC TUBING, AND A MIDNIGHT TUBE-RUNNING OFFICE VISIT, IT CAN BE BLOWN ON UNSUSPECTING CO-WORKERS FROM BEHIND CLOSED DOORS. 20. REV UP THAT GRILL: STAND BACK ABOUT TWO FEET AND REV UP YOUR CHARCOAL GRILL FIRE WITH A FEW BLOWS! 21. BLOWING UP SKIRTS À LA MARILYN MONROE. 22. WART REMOVAL: INVERT CAN, SPRAY TO FREEZE WART. 23. FREEZE GUM THAT IS STUCK IN THE CARPET OR UPHOLSTERY AND THEN REMOVE WITH A PUTTY KNIFE. 24. REMOVING CATS FROM KEYBOARDS. 25. REMOVING ANNOYING NON-IT COWORKERS (THEY USUALLY THINK IT’S SOME SORT OF HARMFUL CHEMICAL). 26. REMOVING TOILET WATER FROM A CELL PHONE DROPPED THERE BY MY 16-YEAR-OLD. 27. PAPERWEIGHT – PARTICULARLY USEFUL WHILE USING ANOTHER CAN TO DUST DESK. 28. ON SLOW DAYS, DRAW A SHUFFLEBOARD DIAGRAM ON A TABLETOP; USE CANNED AIR TO SHOOT BOTTLE CAPS TO SCORE. 29. CANNED AIR IS PERFECT FOR CLEANING THE CUT WHISKERS OUT OF YOUR ELECTRIC RAZOR. 30. CLEANING RESIDUE FROM COFFEE GRINDER. 31. BLOWING EXCESS CHEESE OUT OF YOUR MAC ‘N CHEESE. 32. INFLATING UNDERSTUFFED RAVIOLI TO CREATE THE ILLUSION OF OVERSTUFFED. 33. PUT A FROTH OF FOAM ON YOUR COFFEE, AND IT’S CHEAPER THAN STARBUCKS. 34. TURN THE CAN UPSIDE DOWN AND QUICKLY COOL YOUR FAVORITE FLAVOR OF JELL-O AFTER BOILING IT IN THE MICROWAVE. PARTICULARLY EFFECTIVE FOR GREEN JELL-O. 35. ALSO GREAT FOR THAT HALF-BOTTLE OF MOUNTAIN DEW ON THE CORNER OF THE DESK WHEN YOU JUST WON’T DRINK IT WARM. 36. FILL CAN WITH MILDLY PRESSURIZED, PURIFIED AIR (NOTHING BUT 78% N2, 21% O2, 0.94% AR2, 0.03% CO2 AND A 0.03% MIX OF OTHER NATURAL ELEMENTAL GASES). THIS RESULTS IN A COLORLESS AND ODORLESS MIXTURE. THEN, WHENEVER YOU TIRE OF THE SMELL AND POISONS OF POLLUTION, JUST SPRAY THE PURE AIR IN YOUR FACE AND BREATHE DEEP! 37. INDOOR MODEL ROCKETRY: TAKE ONE OF THOSE HANDY LITTLE FILM CANISTERS NORMALLY USED FOR HOLDING CASE SCREWS – TAPE ROCKET STYLE FINS TO THE CANISTER. IMPORTANT: THE FAT END OF THE FINS MUST BE AT THE OPEN END OF THE CANISTER. WHILE HOLDING THE CANISTER OPEN END UP INVERT THE CANNED AIR AND SPRAY INTO THE CANISTER FOR SEVERAL SECONDS CREATING A 1/8 INCH DEEP POOL OF PROPELLANT. IMMEDIATELY PLACE THE CAP ON THE CANISTER AND PLACE CAP DOWN ON ANY LEVEL SURFACE. IN A MATTER OF MOMENTS THE “INDOOR ROCKET” IS LAUNCHED AT EXTREMELY HIGH SPEED INTO THE AIR / CEILING TILES / BOSS’S OFFICE. 38. SUPPORT THE WIND POWER INDUSTRY BY KEEPING THE TURBINES GOING WHENEVER THE WIND DROPS. 39. SPRAY LIBERALLY TO COOL THE AIR WHEN GLOBAL WARMING HEATS IT. 40. 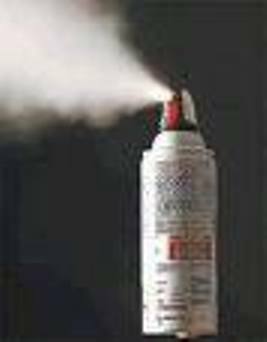 SPRAY LIBERALLY TO WARM THE AIR WHEN GLOBAL WARMING PRODUCES UNUSUALLY COLD WEATHER. 41. BLOWING BUBBLES; SIMPLY INSERT INTO THE LITTLE BOTTLE AND ZILLIONS OF BUBBLE APPEAR FROM NOWHERE. 42. EMERGENCY CAN OF AIR FOR FISH TANK, WHEN THE FISH TANK PUMP BREAKS DOWN. 43. HELP BLOW MILK OUT OF YOU NOSE. 44. SHOOT PAPER WADS OUT OF STRAW. 45. PLAY AIR HOCKEY AT MCDONALDS WITH TRIANGLE STRAW. 46. TURN PAGES IN YOUR SMART COMPUTING MAGAZINE. 47. CREATING DUST DEVILS – INSERT INTO BAG OF POWDERED SUGAR AND LET IT RIP. 51. BLOW IT IN THE FACE OF YOUR DOG TO CREATE THE ILLUSION OF HANGING HEAD OUT OF WINDOW WHILE DRIVING. 52. BLOW IN YOUR CAT’S FACE SO SHE CAN PRETEND SHE IS BEING CHASED BY THE DOG IN THE CAR. 53. FORCING SAND FURTHER INTO SENSITIVE MACHINERY TO INCREASE WEAR FACTOR. 54. COOLING DOWN THE ARM PITS, ESPECIALLY WHEN HOT AND WET. 55. SINCE THE CANNED AIR DOESN’T CONTAIN AIR, BUT SOME HEAVIER THAN AIR GAS — IT CAN BE USED TO MAKE “HEAVY BALLOONS” THAT FALL TO THE GROUND LIKE BRICKS. SURE TO AMAZE YOUR COWORKERS! 56. IRRITATE NEXT DOOR’S PIT BULL. 57. SEE JUST HOW BIG YOU CAN INFLATE A BULL FROG BEFORE IT POPS. 58. TURN THE PAGES ON A CALENDAR ONCE A MONTH. 59. WIN EVERY TIME PLAYING BALLOON-KEEP-UP. 60. THERE ARE A LOT OF MACHINES IN THE LAB AND THE WHITE NOISE TENDS TO LULL TIRED TECHNICIANS TO SLEEP. A SQUIRT OF CANNED AIR TO THE EAR WAKES ‘EM RIGHT UP! 62. A VERY SHORT SHOT OF AIR WILL FORCE INK INTO A REFILLED CARTRIDGE. INSERT IN FILL HOLE, COVER WITH PAPER TOWEL AND GIVE A BURST. INK WILL FLOW FROM THE JET NOZZLE OF THE CARTRIDGE. TOO MUCH AIR WILL MAKE A MESS! 63. USE TO BLOW OUT WINDSHIELD WIPER HOSE. 64. TAPE CAN TO MODEL BOAT, THEN TAPE DOWN NOZZLE AND PUT IN WATER. 65. USE A LOT OF CASES OF AIR TO BLOW OFF LEAVES FROM YARD. 66. BLOW OUT RAIN GUTTERS. 67. BLOW BUBBLES IN BATH WATER. 69. HELP GET KITES OFF THE GROUND. 70. BLOW SAND INTO YOUR BROTHER’S SHORTS. 71. INSERT INTO FRONT OF PANTS AND COOL DOWN. 72. AS A FISHING AID: USE THE CANNED AIR TO SAIL THE LINE OUT. 73. KEEPING THE CAT OFF OF THE SOFA. 74. CHILL A PITCHER OF TEA, PUT CAN INTO TEA AND PULL TRIGGER. 75. IF YOU HAVE NOTHING BUT A WARM CAN OF SODA AND THE ICE TRAY IS EMPTY, YOU CAN FREEZE THE WATER IN THE BOTTOM OF A PAPER CUP…INVERT THE CAN AND SPRAY INSIDE THE CUP. 76. FREEZING BODY PARTS OF UNWELCOME VISITORS IN YOUR OFFICE – INVERT THE CAN, AIM AT BODY PART AND SQUEEZE WHILE INFORMING THE USER THAT YOU DON’T TAKE WALK-IN REQUESTS. IF REPEATED WITH SUFFICIENT FREQUENCY AND CONSISTENCY THIS SHOULD ELICIT A PAVLOVIAN RESPONSE AND CREATE AN AVERSION TO NOT FOLLOWING THE CORRECTION PROCEDURE FOR SUBMITTING A HELP TICKET. 78. REMOVING CHEWED OFF FINGERNAILS FROM KEYBOARD. 80. MAKING OBNOXIOUS ARMPIT NOISES – INSERT STRAW IN ARMPIT, SQUEEZE ARM TO SIDE OF BODY AND PRESS TRIGGER. 81. EXPELLING ANTS FROM YOUR WORK AREA. 82. COOLING YOUR COFFEE IN A CAFFEINE EMERGENCY. 83. REMOVING IRRITANTS FROM BRA WITHOUT HAVING TO DISROBE. 84. EJECTING THE FLUFF FROM BETWEEN TOES WHILE AVOIDING ACTUAL CONTACT. 85. COOLING SKIN WITHIN A CAST. 86. AS AN AIR-BRUSH PROPELLANT. 87. PLAYING THE ENGLISH GAME OF “BLOW FOOTBALL” – TRADITIONALLY PLAYED BY BLOWING THROUGH STRAWS, BUT EXPEDITIOUS USE OF CANNED AIR MAKES FOR LONGER AND MORE CHALLENGING GAMES WITH REDUCED RISK OF ASPHYXIATION. 88. RIDDING INFREQUENTLY USED POWER SUPPLIES OF BROWN RECLUSE SPIDERS (THIS HAPPENED…). 89. COOLING YOUR FEET OFF WITHOUT HAVING TO REMOVE SOCKS OR SHOES – INSERT STRAW IN SOCK AND SQUEEZE TRIGGER. BE WARNED THAT THIS HAS THE ADDED BONUS OF LIBERALLY DISTRIBUTING BODY ODOR IF YOU SUFFER FROM THIS PROBLEM (THIS ALSO APPLIES TO 5). 90. ADDING FOAM TO HOT CHOCOLATE. 91. LOCATING PRECISELY WHICH TOOTH IT IS THAT HAS BECOME COLD SENSITIVE. 92. PAINTING WITH HOT AND COLD. 93. BLASTING THE CRUD OUT OF MICE. 94. THE INCREDIBLE GROWING PUTTY BALL. 96. SURPRISING A NAPPING CAT. 97. CONFUSING TELEMARKETERS – NOT AS EFFECTIVE AS AN AIR HORN, BUT STILL QUITE ALARMING. 99. CLEARING SINUSES (DON’T TRY THIS). 101. QUICK-DRYING PLAYDOH® SCULPTURES OF MINIATURE DONKEYS MADE AT DESK ON SLOW DAYS. This entry was posted on Saturday, July 21st, 2007 at 10:06 pm and is filed under Off Beat, Tech. You can follow any responses to this entry through the RSS 2.0 feed. You can leave a response, or trackback from your own site. Excellent post. Keep it up! This is very up-to-date info. I’ll share it on Digg.